I have deleted you both as requested :-) I sympathise with your identity confusion - I get confused by my email alter egos. Arm warmers - mmmm - I am obviously way behind regarding recent fashion trends. I remember leg warmers though, but perhaps I shouldn't. Those tomatoes look sad - just like some of mine. Hey Lucy, Nice blog, you can refer to me anytime! 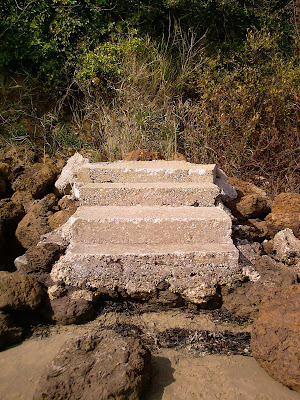 Those steps to nowhere seem very lonely. Those sleeves are arm warmers? My girls wore leg warmers when they went ice skating. Very interesting, I will have to ask my 12 year old going on 21 Granddaughter about them. I would still like to see a picture! 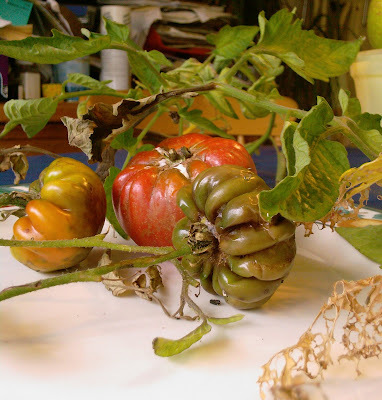 Yes, those are some scary looking tomatoes. (Thanks for the link love.) I think I would prefer the crumbling castle to the gift-shop-equipped tourist version, but then I love wild places and wildness overtaking the remains of civilization, like all those beautiful ruins scattered all over Italy. Sleeves on tomato stems? I admit i don't know what those look like, but assume they help provide strength to hold all those tomatoes? Monastery-Dissolusioning workshops, or Church Founding 101, am I right? They never teach the practical things in school anymore. Sheesh! The tomatoes I planted (referred to in my first post) have done practically nothing at all. 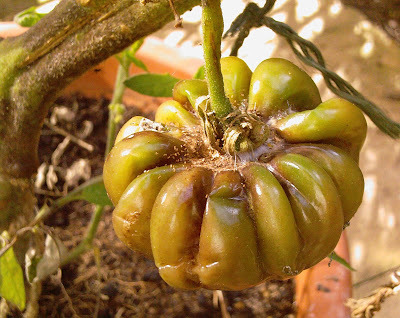 They were kept in their pots for far too long; planted into ground that obviously had no goodness in it; got far too hot over the summer – everything shuts down over 28°C or so; not enough sun; irratic watering … need I go on ? ! Thanks for being a follower – I appreciate it very much ! I'm having trouble with feeds to PICTURES JUST PICTURES . Followers cannot access it at present through their Google Dashboards and it isn't possible to click to the blog through Google Readers either. I'm assuming people using other Readers will be experiencing the same problem. Please excuse this format message - but I'm cutting and pasting it to 'Followers' and to other people who have left messages on PICTURES JUST PICTURES from time to time. When I have worked out what to do - I will. Meanwhile, I will continue to post daily. You can either use this link PICTURES JUST PICTURES or click through from the sidebar of LOOSE AND LEAFY. Oh my, those are some forlorn-looking tomatoes Lucy!